An open day was held in July for staff and stakeholders to celebrate the 50th anniversary of production starting at the Darlington plant. Fifty years ago on 13 July 1965 Cummins officially opened its engine production plant at Darlington, initially producing Vee engines. The plant began as a joint venture with Chrysler but since 1968 has been a wholly Cummins owned operation. Over the ensuing five decades the story has been one of considerable and increasing success that has seen it win no less than four Queen’s Awards for Export, the first in 1970 and the latest in 2007. 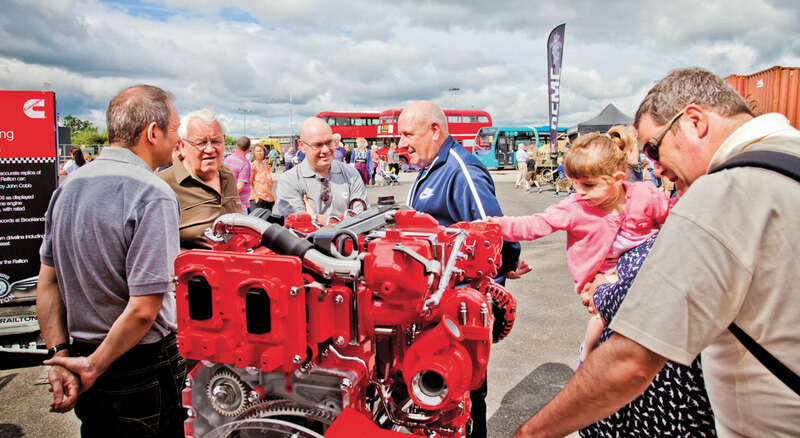 An Open Day at the plant for employees, their families and local stakeholders was recently held to celebrate the half century at which a number of products from the plant’s past were displayed. 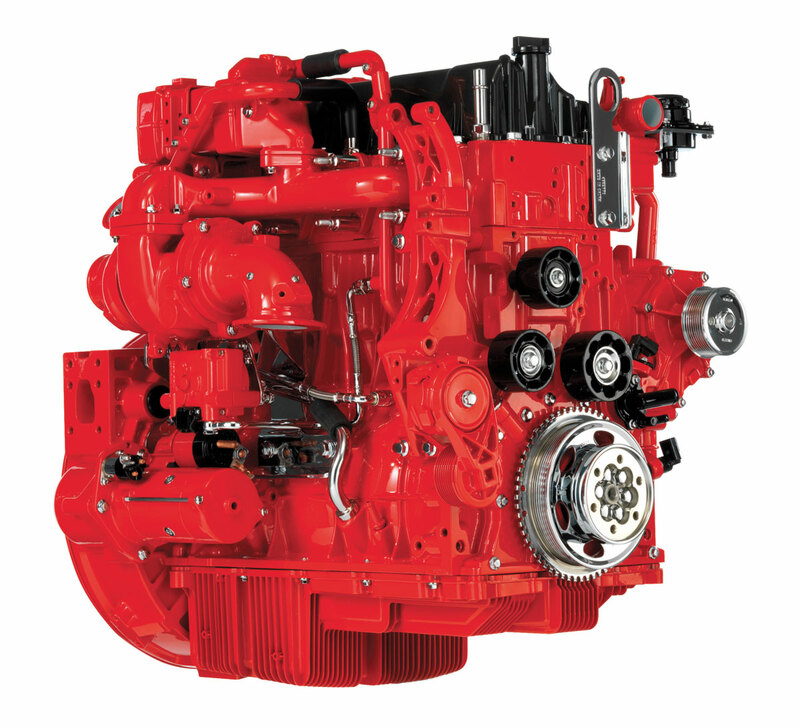 Cummins runs a fully flexible system which enables every one of the thousands of engine options to be built on the single line. 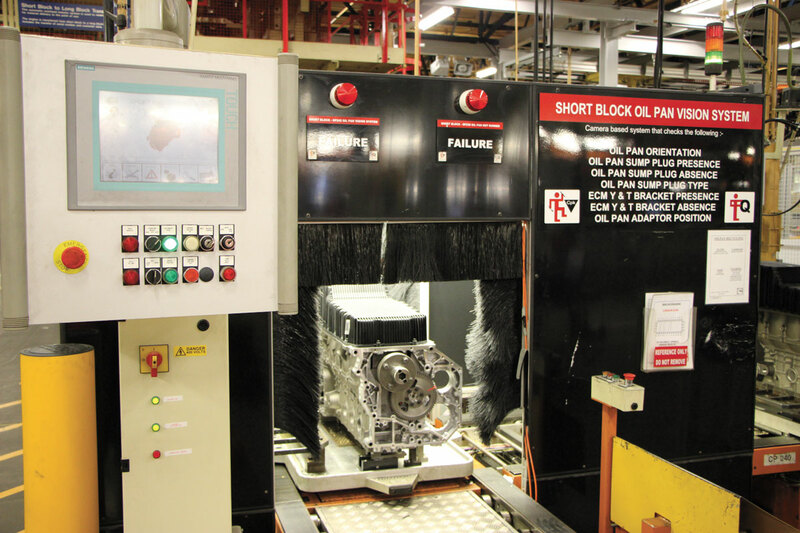 This machine checks that a short block has been correctly assembled for the application specified by the customer. Last week, the press were invited to the North East not only to see round the plant and witness the ongoing investment, but also to see what Cummins has in store for the future, particularly with regard to the OBD C (on board diagnostics level C) changes to the regulations which come into effect on 1 January 2017. Work on building the imposing Darlington plant had begun in 1963 and was completed at a cost of £8.5m in 1965, with the component plant next door opening the following year. Since 2008 the component plant has been dedicated to producing exhaust aftertreatment systems for Cummins Emissions Solutions. Between the two plants is the Technical Centre, housed in a separate building. A virtually complete engine on the overhead line shortly before the painting process. From its opening until the mid eighties the engine plant’s workload was production of the Small Vee range consisting of the 5.7-litre V6 VAL and 8.3-litre V8 VALE models, offering outputs of between 100-210hp for customers including Ford and Dodge. The V555 unit Daimler used in the Roadliner model was normally a US built model but those for the UK were also Darlington built. These high revving (3,300rpm) units had been developed with the intention of replacing petrol units and over 350,000 were manufactured before production switched to the B-Series. A plinthed example of a Vee unit sits in the factory concourse alongside the one millionth mid range engine built at the plant. 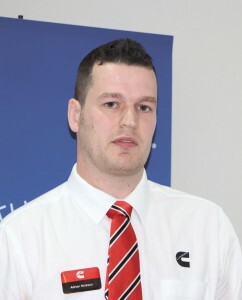 Adrian Hickson, Application Engineering Manager. it. If you compare a VALE V8 engine with the latest Euro 6 ISB6.7 engine, the current generation has 67% higher power and 100% higher torque yet the displacement and weight are 20% lower. This despite a 99% reduction in emissions. Yet there are similarities between the Small Vees and the current generation, such as high pressure fuel systems, cylinder heads with four valves per cylinder, a rear gear train configuration, high power to weight ratio, and components made of the latest materials designed for durability and reliability. Peter Williams, Product Certification & Compliance Director – Europe & Middle East. plant manager. 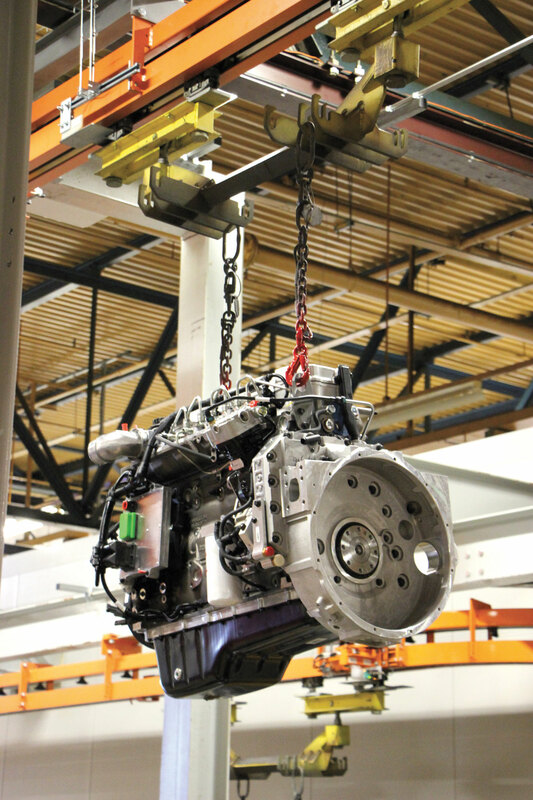 The total number of engines built has now topped the 1.5m mark and approximately 40,000 more are built each year, leaving the plant at the rate of 150-200 a day to any one of around 2,000 possible specifications. Most engines have 2,000-2,500 separate parts though the total inventory of parts required to build every model is 25,000. The current range of engines manufactured at Darlington is the four-cylinder B3.9 and B4.5 and the six-cylinder B5.9, B6.7, C8.3 and L8.9 units covering an output span between 75hp and 400hp. In terms of their relative production volume, 44% are 6B6.7 units and 29% are the 4B4.5. By no means all are to Euro6 standard because some markets still have much less stringent requirements and in many case will not be able to take Euro6 until the quality of diesel available locally is improved. Although early examples of the Euro6 ISB4.5 were built in China, those for bus application are now being built in Darlington because of the extra flexibility needed in this sector. 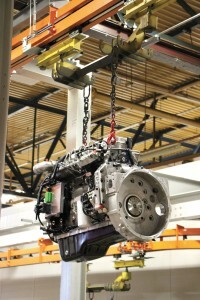 Darlington is one of eight major plants within Cummins making engines of this size, and over 80 production sites in total. 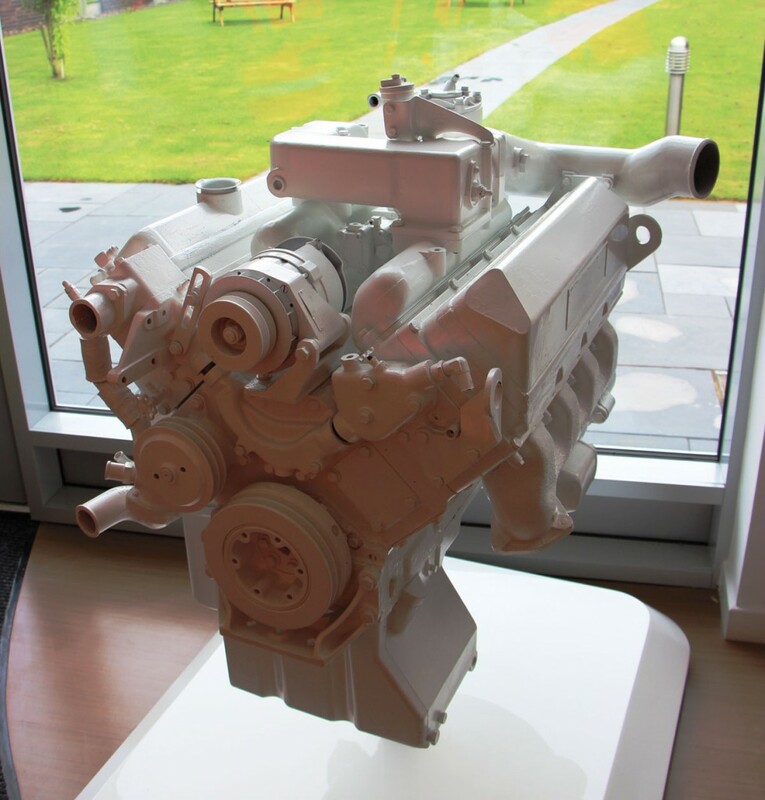 The only other engine plant in the UK is at Daventry, where production is of the huge 38-91 litre units used in boats, locomotives, mine equipment and power generation. Seen on a plinth in the plant, this is the one millionth mid range engine produced at Darlington. It was completed in 2011. Since my last visit to the plant three years ago, a further £9m of investment has gone in. Recent purchases include a completely new paint plant. Further spending will see new test cells installed costing approximately a further £2m. Engines built at Darlington are not exclusively for powering road vehicles, although trucks (33%) and buses (20%) together account for more than half of what is built. suppliers, as well as other parts from across the globe. Cummins’s own in-house capabilities are also considerable, as was evidenced by items such as the turbochargers which are produced by Cummins Turbo Technologies in Huddersfield and twin branded with both Cummins and Holset names. checking procedures throughout, including an X-ray machine that checks for cracks, a “vision” machine that measures everything to check that the right parts have been fitted in correspondence with the specification, and once the engine is complete and filled with fluids, a hot test that puts each unit through a two-minute test. Cummins’ Euro 6 six-cylinder ISB6.7 turbocharged engine. With each generation of new engines reliance on computers becomes more critical. Darlington uses ECUs (electronic control units) produced by Continental that are programmed by four machines in a process that takes eight minutes. Different sub assembly sections put together various key components off line, and deliver them to the operator. Having been on a single line throughout the plant, at the very end of the line there are four separate lanes where any extra parts requested by the customer, such as a compressor or an air conditioning unit pulley or a crank fitting, can be added. Factoring in any reworking that may be necessary, the manufacturing process takes approximately 16 hours from end to end for each engine. To meet Euro6, Cummins (in their own words), threw every technology they had at it in order to meet the toughest challenge they had ever had to face. The signs to date are that it has paid off as they claim to be getting really good feedback and there have been very few issues. Going forward, there is a continuing focus on total operating costs, with full recognition of the importance of tailoring installations to get the best performance using sustainable technologies with a reasonable pay back period. 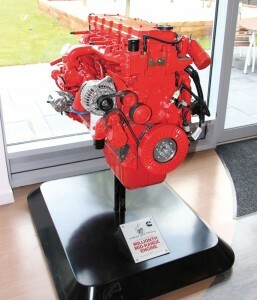 The Euro6 Cummins ISBe four-cylinder engine. Under the Euro6 regulations the legislators were determined to ensure that real life emissions were the same as those achieved on manufacturer’s test benches. To this end they require permanent monitoring of engines with regard to a host of different parameters. Under OBD A and B, there was no particulate matter (PM) threshold, with performance monitoring considered sufficient, but under OBD C the PM OBD threshold becomes 25mg/KWh. At the same time the NOx threshold has been reduced from 1,500 mg/KWh to 1,200 mg/KWh and an IUPR (in use performance ratio) limit of 0.1 introduced. Requirements for gas engines introduced for the first time at OBD B (1 September 2015) remain the same at OBD C.
Another requirement introduced, in order to ensure that there is no tampering with flow of or dilution of the AdBlue used, says that NOx control monitoring should ensure an AdBlue quality level of 460mg/KWh and a water content rate of no more than 20% over a 48 hour period. (It may still be that the flow rate requirement level will remain at 50%). If these parameters are exceeded, the system will first show a driver warning light, after ten hours it will introduce a torque limitation and after 20 hours it will cut the vehicle speed to 20kph (which sounds pretty dangerous if you are on a motorway with a load of passengers). Explaining what Cummins has done with the new generation engines to improve on the existing Euro6 units, Adrian Hickson, Customer Application Engineering Manager, said that the focus was on fuel economy and that one size did not fit all with different solutions needed for different installation and duty cycles. A lot of work had been done building relationships with transmission and Tier 2 suppliers. A lot of time was also being spent looking at accessory load management and at parasitic draws on power. Customers can choose what colour they want their engine painting. New from the middle of next year will be User Selectable Fuel Economy settings which would come as standard within the engine package and could be turned on or off or tailored. It enabled the engines torque curve to be altered, but in a manner that the driving experience still felt natural. A maximum of 15% fuel improvement was mentioned, though this was for manual gearbox applications, with the potential for buses with auto transmissions considerably less. Surprisingly, research has revealed that some buses never use maximum engine power. On the latest engines, there had been alterations to the base engine characteristics which had been recalibrated based on real life experience of specific cycles. It was estimated that this would bring a 4-6% economy improvement. Adrian estimated that the total fuel saving operators could expect from a 180hp four-cylinder engined bus between Euro5 and the latest Euro6 was 10%, more for some other applications. David Stollery, Product Planning Manager, ran through the changes that will be introduced to the 2017 engine range, partly in the light of the legislation changes that Peter had earlier run through. He explained that the aim had been to build on the successful Euro6 experience to deliver engines with minimal engine and installation impact with no additional engine hardware or changes to the aftertreatment system. Another objective was to align the range with the capabilities of the transmissions available. Despite the constraints, it had been possible to increase the torque and power ratings. He pointed out that since the Euro6 launch, 18,500 Euro6 units had been delivered worldwide of which 3,500 were for bus and 1,000 were for coach. On all models, the front cover, wiring harness and crank positions had been changed and the speed sensor altered, the ECM had also been recalibrated. Looking at the four-cylinder ISB4.5 unit, while advertised power remained in the 150hp-210hp range, and the weight, bore, stroke and governed speed (2,300rpm) remained the same, the peak torque had been increased from 760Nm at 1,400rpm to 850Nm at 1,200rpm on the 210hp. On the 150hp the torque went from 580Nm at 1,400rpm to 650Nm at 1,000rpm. At 180hp there were two separate options: that for bus was 700Nm at 1,000rpm rather than 700Nm at 1,400rpm while the coach rating was 750Nm at 1,100rpm rather than 700Nm at 1,400rpm. The marked engine speed reductions should have a big impact on economy. At the same time service intervals had been extended to 90,000km or over 2,000 hours. On the six-cylinder ISB6.7, the top power rating for buses increases from 280hp to 300hp giving a peak torque of 1,200Nm at 1,100rpm. The top coach rating increases from 310hp to 320hp with torque increases from 1,100Nm at 1,200rpm to 1,200Nm at 1,100rpm. The other bus ratings are: 220hp/900Nm at 1,000rpm; 250hp/1,000Nm at 1,000rpm; and 280hp/1,100Nm at 1,000rpm. For coach they are: 230hp/900Nm at 1,000rpm; 260hp/1,000Nm at 1,000rpm; and 290hp/1,100Nm at 1,000rpm. There are similar improvements to the service intervals to those on the four-cylinder engines. On both engines, there is no special oil package necessary though there is a switch to 10W30 lower viscosity oil. The same oil can be used in earlier Euro6 engines. Cummins believe these figures on both ranges now represent best in class power to weight ratios. It is anticipated that the new higher output for the bus engine will prove very popular in double deck applications. It might also present the opportunity for downsizing for those currently using nine and ten-litre units. Availability of the new ranges is expected to commence in September 2016. 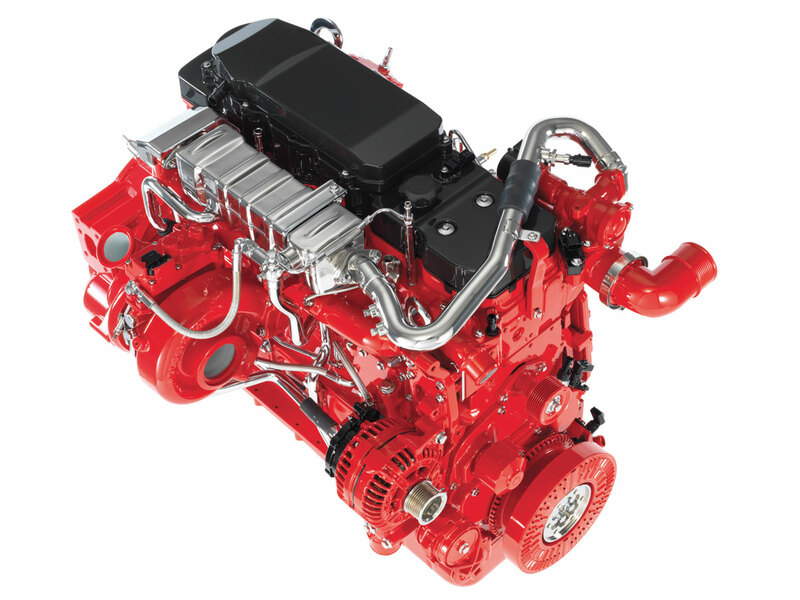 Beyond Euro6, Cummins believe that there will not be a Euro7 in respect of pollutant levels, instead the authorities hope to drive continued improvement through more efficient use of fuel, thereby reducing CO2 emissions. The means they have devised to do this is a tool called VECTO which will require vehicle manufacturers to provide comprehensive performance details on their products which they believe will help operators make purchase choices and local authorities to calculate assessments of fleets. Coach is one of the three sectors the regulations will apply to, along with long haul truck and delivery vehicles. While VECTO may work well enough in respect of vehicle specific implications on the one vehicle type range it has so far been tested against, Cummins believe the idea is flawed because it does not reflect engine improvements made to the base engine or in respect of aftertreatment, air handling or controls and, probably more importantly, it does not take account of integration optimisation through the powertrain, hybridisation or duty cycle optimisation. They would prefer to see a system that took account of all of these factors. One of the Small Vee units produced at Darlington when the plant opened in 1965. It was suggested that there was a risk to European manufacturers in EU legislators not setting specific limits with VECTO and taking so long to define where they are going. To date Euro emissions regulations have been adopted around the word, giving European manufacturers a leading market position. This may be forfeited if other regions follow alternative CO2 regulations such as North America due to a lack of direction in Europe. For all of these reasons Cummins would prefer specific limits. 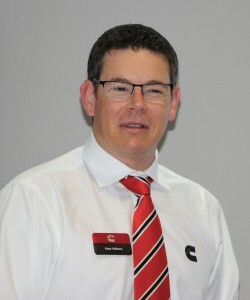 Ashley Watton admitted that the level of continuing Euro5 demand from UK bus operators had come as something of a surprise to Cummins, as an earlier switch to Euro6 had been anticipated, though Euro5 demand was now very low. It was anticipated that in 2016 Euro6 demand would exceed 95% for the UK. Cummins has embraced the challenges and opportunities of Euro6 and is firmly placing the emphasis on working closely and proactively with its partners and customers (both vehicle manufacturers and operators) to ensure that its engines and portfolio of systems deliver the optimum performance to minimise TCO. 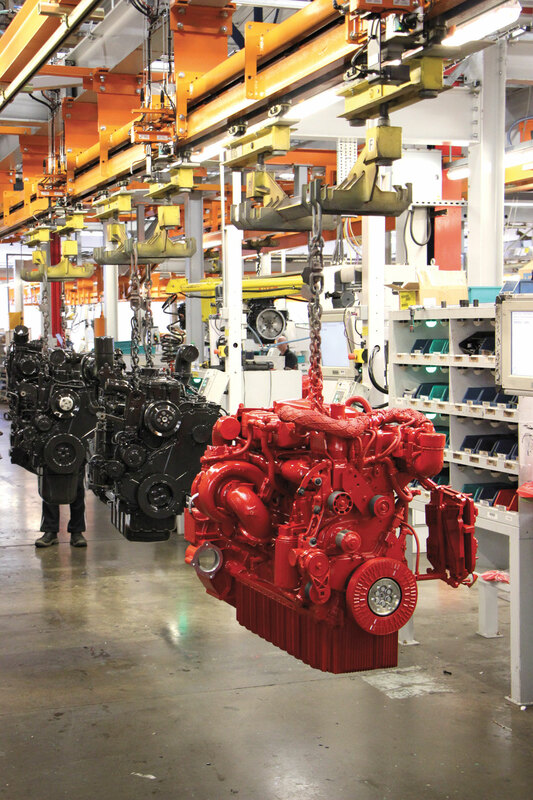 Though each of Cummins’ plants must compete to justify ongoing investment in them, Darlington’s performance and quality place it well to enjoy many more significant birthdays.